While most of the experienced drivers skip this step, jump right into the driver's seat and drive off, beginners should never underestimate the importance of the pre-drive checklist. Looking behind the vehicle to make sure there are no children and animals there, making sure your seat belt is on, adjusting your seat and mirrors, making sure the windshield is clean - you have to go through all these things every time before you start driving. Remember that this is a standard ore-drive checklist the DMV will want to observe you doing before the driving test and there is no way you are going to remember how to do all these things unless you make it part of your daily routine. 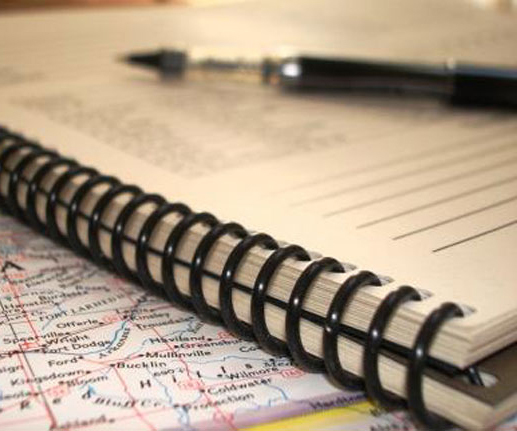 Don't give yourself a chance to fail the driving test even before it starts – make this pre-drive checklist a part of your everyday driving routine and always cover it before you start driving. Your pre-drive checklist starts outside the vehicle. 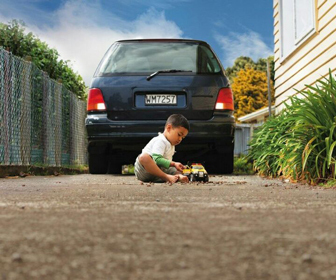 Walk around the car and look for any animals, children or small objects that may be in your way. You will not be able to see these things from behind the wheel since your view will be obscured by the hood and the trunk of the vehicle. Visually inspect the headlights, break lights, taillights, windshield and all other windows. They need to be reasonably clean, especially the windshield. 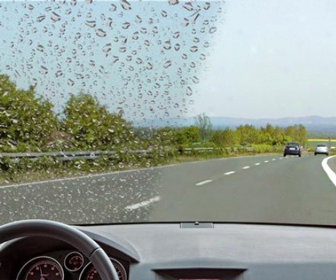 Having a dirty windshield will result in reduced visibility and may create a nasty glare in sunny conditions. Check the tires, see if they look deflated or have visible damage. 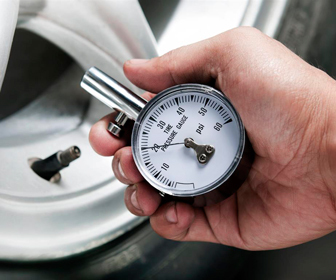 You should check your tire pressure monthly, since visual inspections do not always allow to correctly estimate tire pressure. 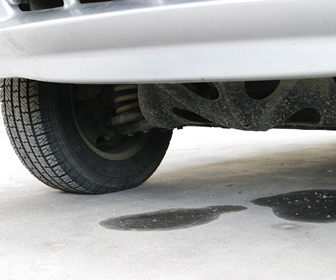 Have a quick look under the vehicle to see if there is any leakage of fluids. Making sure that you are seated in the right position and adjusting your seat is the first thing you should do when you get inside the car. 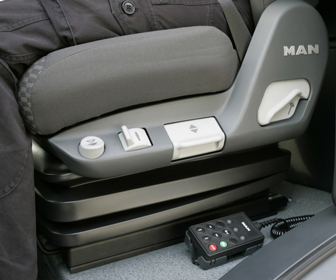 Most of the controls that allow you to adjust the seat are located on the left side of the driver's seat. They can be mechanical or electronic, depending on the vehicle you are driving. When adjusting the seat, you should position yourself close enough to be able to reach all controls and pedals comfortably and be outside of the operating zone of the airbag. 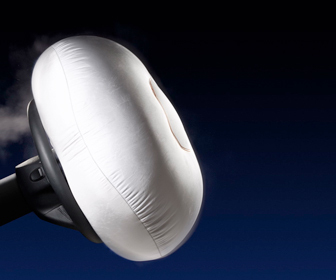 Airbags are stowed in the dashboard or the steering wheel and inflate in case of a head-on accident. If you sit too close to the steering wheel, you may be injured when the airbag is deployed. Most airbags require approximately 10 inches of space when they are open, make sure not to sit this close to the wheel. Adjust rear and side view mirrors. Adjusting the rear view mirror is easy – just make sure the center of the rear view mirror matches the center of the rear window. 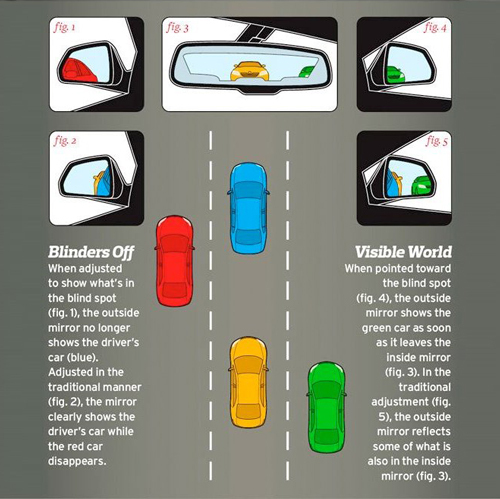 Adjusting side view mirrors is a little more complex and there is still no agreement over their optimal position. The conventional way of setting your side view mirrors requires you to position them in such way that you always see a rear door handle in the lower inside corner of the mirror. This way is especially good for beginner drivers because it helps to relate the vehicle to the surroundings. However, this also increases the size of blind spots around your vehicle. Another way to set your side view mirrors involves setting them in the first position and then rotating them a little further to the outside, until the flanks of your vehicle disappear completely. This greatly reduces the size of those blind spots around the vehicle, but may be somewhat uncomfortable for those using the flanks of the vehicle for reference. Adjust your seat belt. The diagonal strap should be worn across the chest, the lower strap should go over the upper thigh area, not your stomach. 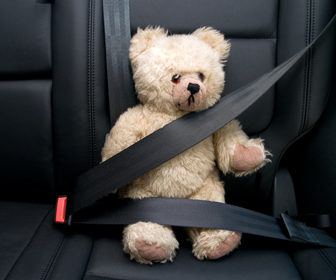 Make sure the seat belt is not twisted, it should lie flat across your body. Once you have gone through all these steps, you are ready to insert the key into the ignition lock and start the vehicle. Have a safe trip!